While I was djing at a local milonga in Amsterdam a girl came to the DJ desk and told me: “I know this tango!” So I said: “Yes, it’s Melodía del corazón interpreted by Edgardo Donato and his orchestra.” She then explained that she didn’t really mean to know it from the milongas but from her sister’s piano lessons. Her sister was actually rehearsing on these tunes. On another session she told me that her sister was actually playing Fédéric Chopin’s Étude Op. 10 n°3 “Tristesse” in E major. And indeed the main theme of this piano étude directly entered into the tango Melodía del corazón. Not as a cheap carbon copy but nicely rearranged around the Chopin theme. Let’s say that the composers of this tango, Fioravante Di Cicco and Héctor María Artola, have been insprired by Frédéric Chopin (1810-1849). “The great majority of Chopin’s compositions were written for the piano as solo instrument; all of his extant works feature the piano in one way or another. 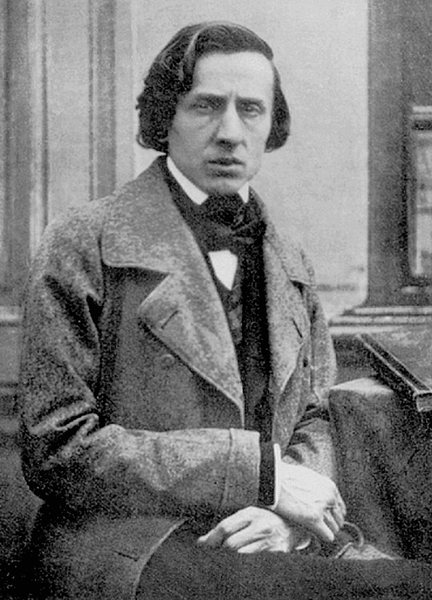 Chopin, according to Arthur Hedley, ‘had the rare gift of a very personal melody, expressive of heart-felt emotion, and his music is penetrated by a poetic feeling that has an almost universal appeal… Present-day evaluation places him among the immortals of music by reason of his insight into the secret places of the heart and because of his awareness of the magical new sonorities to be drawn from the piano.’ “ [Wikipedia]. So no wonder, they called this tango Melodía del corazón (The melody of the heart). This is also underlined with the lyrics by Carmelo Santiago sung by Romeo Gavioli in the 1940 Donato version. The Edgardo Donato recording is not the only Di Cicco-Artola version, there is also a Francisco Canaro interpretation with the singer Francisco Amor. Both versions are from the year 1940, the SADAIC has the tango registered on the 19-01-1940. At the root of all these versions there is an even earlier record with the same Chopin melody. This work is not based on the Di Cicco-Artola partition but on an arrangement by Mario Melfi in Paris and it’s called Reviens mon amour. 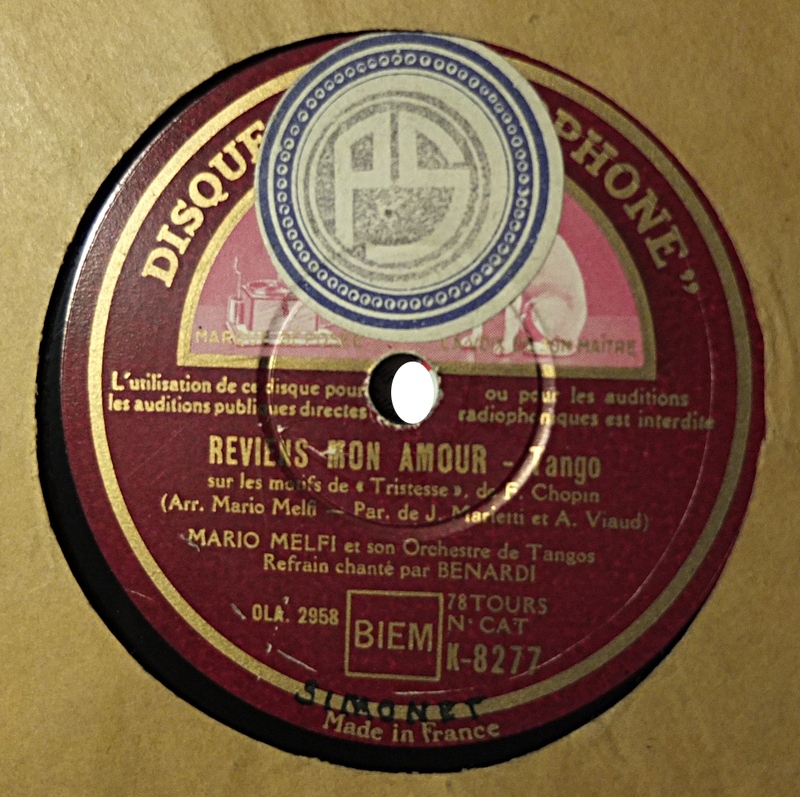 The 78 RPM record contains an explicite note: “sur les motifs de Tristesse de F. Chopin”. This version is interpreted by Mario Melfi and his orchestra himself and the refrain singer is Benardi (Jean Bernardi?). 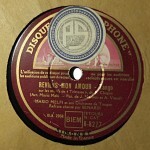 The record has the HMV matrix number OLA 2958 (disk number K-8277) and has been issued in 1939 in France. Maybe it has freely inspired the Argentinian Di Cicco-Artola version. There are a lot of popular tangos which have been composed in Paris and then later performed in Buenos Aires. Let’s quote one of the most famous: Poema, for which Mario Melfi wrote the lyrics. Between the two wars, but also at other moments, Paris has been some kind of tango test tube where a lot of interesting ideas converged. The tango Vous, qu’avez-vous fait de mon amour ? is an interesting example, originally an Hungarian tango by the composer Tibor Barczi, it has been very popular in Paris during the 1930’s. There are serveral recordings of this tango in France, an often played and timeless version is certainly the one by Orlando et son orchestre du Bagdad from 1933 with the famous singer Tino Rossi. A couple of years later this tango came to Buenos Aires and has been recorded as Sueño Azul by Osvaldo Fresedo. Tibor Barczi’s original title of this tango is Jo a két szemedbe nézni. Enrique Delfino was a big admirer of Puccini, Verdi and Wagner and had a deep knowledge about musical theory. So if we are looking for musical quotations or references we can also cross listen to all these beautiful Enrique Delfino tangos and the work of Giacomo Puccini, Guiseppe Verde and Richard Wagner to find intersections in their universes. For instance the lyrics of his tango Griseta (1924) contain characters of Puccini’s opera La Boheme (Rodolfo, Mimì, Musetta, Schaunard), Manon Lescaut (Manon, Des Grieux) and Guiseppe Verdi’s La Traviata (adaptation of Marguerite Gautier, heroine of Alexandre Dumas, fils’ novel and play The Lady of the Camellias). It’s like a tribute to his favorite composers. And like in their plots, this beautiful tango can be seen as an allegory of the tuberculosis disease, a recurring motif in tango texts: See for the original lyrics here and for an English translation here. But tango wasn’t exclusively inspired from classical or folk music, there have also been references to the popular music of the time. 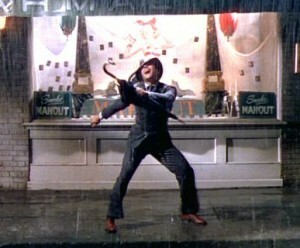 Especially in the late 1920’s and 1930’s there are a lot of foxtrots which are adaptations of world hits like the famous Singin’ in the rain by Nacio Herb Brown published in 1929 and Francisco Canaro’s reprise Cantando bajo la lluvia from 1929/1930. The text is translated to Spanish and the refrain singing is by Charlo, perfect voice for this repertoire. But just listen through all foxtrots by Canaro, Lomuto, Carabelli, Rodríguez and Fresedo and you will find a lot of known songs and tunes. This entry was posted in Music by Jens-Ingo Brodesser. Bookmark the permalink. Do you recognize this ? You’ve written a marvelous article, Jens-Ingo with such heartfelt passion that’s brought such a pleasant smile to my face! I wholeheartedly applaud you in your efforts and hope you continue to bless us with your presence, your gifts and your service. quelle belle surprise et quelle passion dans tes études. C’est vraiment un plaisir pouvoir mieux comprendre la production et l’ispiration éuropéenne des orchestres de tango. I am a great lover of classical music and it always surprise me when I hear an inspiration from it in any kind of music (and especially in tango-music). thank you very much 😉 By the way i didn’t really find a piece of Gershwin in the Caló tango but rather a passage which resembles Gershwin’s style. Or do you exactly know the passage as to be a 1:1 copy of Gershwin? Oh, yes, you are right, Jens-Ingo! I´ve noticed that Gershwin inspiration in blue-note passage and without analysing in detail I directly considered it the same as Gershwin original. But, listen to the Gershwin (that youtube version) from 8:59 – that is the part which is almost 1:1. First 4 chords are the same, then G. continues with melody on the same tone, Calo continues with fourth higher while changing the chord. and inspiration works both way. Have you noticed that motif from “Organito de la tarde” resembles little bit beginning of Beatles “Girl”? and I noticed also this song by popular czech folk group resembles “Sosiego en la noche”…. My personal impression: the Canaro version has a little let’s say “jazzy” foxtrott character with swing ambitions, as the more romantic (perceived) violines played donato version that shows a little more life of its own (further away from the original). Also noticeable from my point of view is the muffled trumpet (?) that takes over a part of the theme (00:35 to 1:04). I may be wrong. Pls. check, would you? Do you by any chance happen to know if there’s a difference in the key in the Donato and Canaro version? Are they supposed to be in the same speed or is the difference intended? Fantastic work Jens-Ingo, putting it all so nicely together! This time, the versions I have of Donato and Canaro are almost at correct speed, so the tempo difference between Donato (67bpm) and Canaro (64bpm) is no technical error but intended. Canaro plays in keys C major (Tristesse melody) and the corresponding A minor (Intro). Part 2b: 2:06 Gavioli sings Tristesse melody in Es major. So, the instrumental parts of Donato and Canaro are in the same keys. Canaro’s singer Francisco Amor sings in the same keys, but Donato’s singer Romeo Gavioli sings a minor third higher. For me the Donato version is closer to Chopin; Canaro seems such a happy fellow that even his tristesse comes with a wink. I love them both. Thank you for your irrististable questions, Jens-Ingo. In tango, keys changes are quit common. Very often, this is to the corresponding major or minor key (every minor key has one corresponding major key; e.g. Am->C in “La melodía del corazón”) or only changing major/minor (e.g. D minor->D major in “Volver” and “A media luz”). I think that, from a tango point of view, Chopin was only moderately depressed, but a modulation maniac: After Tristesse’s initial melody in E major, the 2nd part is B major and c# minor. Than, till the repetition of the initial melody the keys move wildly along: A major – A minor – C# diminished seven – F# major/minor nine – B major – B minor – D# half-diminished seven – G # major/minor nine – E# diminished seven – A# diminished seven – D# diminished seven – G# diminished seven – and B major (he, it is an Etude, a technical study piece). Modulated enough? It ends with the initial melody in the initial key E major. Donato and Canaro used from Chopin only the initial melody and played it lower, in C.
Imagine how more there is to discover it will sureley fill a book (at least!). Indeed the inspitations were shwashing in both directions. 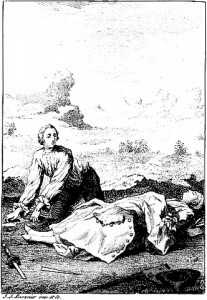 A further example of influences of European folk music is the Russian tune “Очи чёрные”- “Otschi tschornyje” (Black eyes), a melody commonly considered to be a gipsy song but based on “Hommage Valse Opus 21” of the German Florian Hermann (1884) with lyrics of Jewhen Hrebinkas (wikipedia). It’s still very popular: The interpretations are legend from traditional versions like from the Red Army Choir or Patricia Kaas (!) to contemporary jazz and even disco-salsa. However, it’s the blueprint of Francisco Canaro’s great Tango “Ojos negros que fascinan”. When it comes to valse thre are even more “inspirations”. Most known the adaptations from the valses viennoise of Emile Waldteufel aka “Johann Strauss of Paris”: „Amor y primavera“ (F. Canaro, 1935), „Dolores“ (Los Provincianos, 1931), „Siempre fiel“ (E. Rodríguez, 1938) or „Tres jolie“. The latter not only recorded 1932 by OTV but by other European Orchestras like Marek Weber or in 1930, by Dajos Béla, famous leader of a “Salonorchester” and several jazz bands in Berlin. In 1935 he moved to Buenos Aires to play for Radio Splendid and after that for Radio El Mundo (wikipadia). So his fame must be well known in BsAs before, and quite possibel it was his recording which brought the Waldteufel to Tango. One of my favourite theories of “reverse inspiration” is the couple “El Monito” – “In einer kleinen Konditorei”. The first, 1928, composed and recorded by Julio De Caro, the second composed by Fred Raymond (lyrics by Ernst Neubach) in 1929 – not an 1:1-adoption, but an Interpretation with an obvious similarity only in the refrain of the German smash hit. Accidentally? Somewhere – unfortunately I don’t know where – I read that Raymond was on a trip to America before; so belive it or not. There is so much more to say. In the end it shows that the Tango Argentino was not a separated island but a interchanging member of the worldwide music community, crossing boarders of countries as well as of genres.